In the recalled sample, the first four days of therapy had four non-hormonal placebo (maroon) capsules instead of active capsules (pink). Allergan recalled Tuesday nearly 170,000 packs of Taytulla birth control pills given out by doctors as samples because of a possible packaging error that may lead to the risk of an unintended pregnancy. The company issued the voluntary recall of one lot of the pills after a physician reported that four placebo capsules were placed out of order in a sample pack of the oral contraceptive. The packs consist of 24 "active" pink softgel capsules and four maroon placebo softgel capsules. In the affected sample, the first four days of therapy had non-hormonal placebo capsules instead of active capsules. "The reversing of the order may not be apparent to either new users or previous users of the product, increasing the likelihood of taking the capsules out of order," the recall notice on the U.S. Food and Drug Administration website said. "If patients have concerns regarding the possibility of an unintended pregnancy they should consult their physician." Lot No. 5620706 was distributed to healthcare providers nationwide and contained nearly 170,000 sample packs, the company confirmed to NBC. 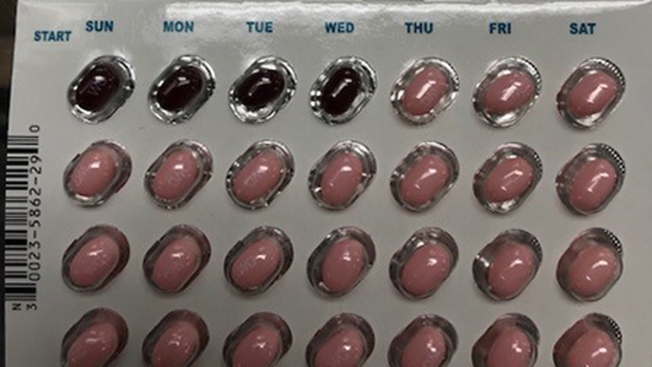 The pill packs have a May 2019 expiration date. The FDA's recall notice said Allergan was notifying customers by letter of the potential issue. Customers with the recalled pills should contact their physician to return the pills. In a statement, Allergan said an investigation at the packaging site found no units with the defect. Consumers can contact Allergan at (800) 678-1605 on weekdays from 8 a.m. to 8 p.m. ET for more information.